Applying for jobs is no walk in the park. There’s nothing worse than feeling like your resume either isn’t up to par, or passing it along to several different companies without a response – especially during notoriously busy hiring seasons. It’s like a job seeker black hole of no return! The Healthcare Effectiveness Data and Information Set (or “HEDIS” for short) hiring season is here, which means healthcare professionals might want to consider doing a resume review! HEDIS is an annual audit on medical records that health plans are required to run. These audits use a variety of HEDIS measures to track year-to-year performance and ensure overall appropriateness of care. Nurses are needed to audit and abstract records, and administrative professionals are needed as support staff. Resumes are identified by powerful statements and keywords. Hiring managers, or other individuals who are browsing through resumes, search for a series of words based on the industry of focus to identify top candidates. For instance, a HEDIS hiring manager might look for the terms like, “HEDIS,” “auditing,” “medical record review,” “utilization review,” “utilization management,” or other key terms related to HEDIS. During your next resume review, make sure you include keywords that relate to the job you are applying for. Simply listing industry keywords isn’t enough to bring your career story to life! That’s why it’s important to check to see if you’ve properly highlighted the experience section of your resume. If you’re worked on a HEDIS project in the past, include which specific parts you were involved with – medical over-reading, medical record retrieval auditing, etc. Being detailed when discussing your specific experience in each role is crucial because it will allow you to be considered for certain positions. When job seekers forget to include credentials in their resume, it can turn out to be a huge mistake! Paying attention to your credentials this HEDIS season is crucial because there are a ton of non-licensed individuals who will be applying for the limited number of jobs that are available, and having a license can help you to stand out as a job candidate. By including this information, hiring professionals will be able to easily identify your experience! Consider listing your credentials at the top of your resume, if you haven’t already. In preparation for this HEDIS season, take a second look at your resume and ask yourself if you are representing yourself well enough to land the job. No one knows your experience better than you do, so be sure to make the time investment into your resume. Do you have any more resume tips that could help healthcare professionals looking for work during HEDIS? Please share in the comments section below! 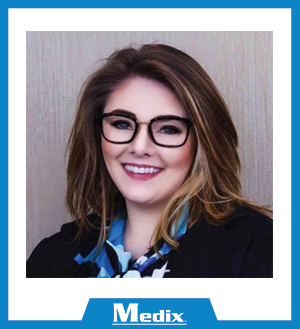 Megan is Medix’s Delivery Lead of HEDIS, and is currently putting her hiring experience to work in our Scottsdale, Arizona office. This entry was posted in Job Seekers and tagged healthcare, Healthcare Effectiveness Data and Information Set, HEDIS, medical record review, nursing, Resume Advice, utilization review. Bookmark the permalink.